Things were quiet at Glassy Bar & Grill, tucked away along Lorong Yap Kwan Seng, during my visit on a sunny Friday afternoon. I was not alone of course, and had the pleasure of Ivy Kam and Vincent Chong of foodmsia.com, and Emily Tang and Eric Thong from Sunrise Emily blog for company. And the effervescent Kelly Chin of Miss Sunshine rounded up our party of five for the day. Miss Kelly of course, had quite a lot to say about this lovely place, check out her blog! 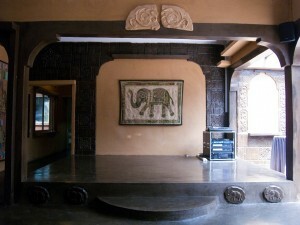 Glassy Bar & Grill has an eclectic feel to it, and incorporates a mix of Indian mysticism and modern sensibilities in its interior design to create a chic and modern ambiance. 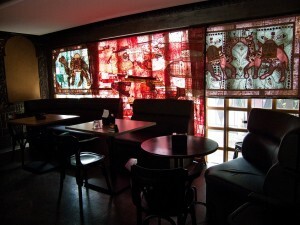 The atmosphere is even surprisingly psychedelic – somewhat of a plus point for an outlet dedicated for the evening crowd of young KLites looking for a place to party the night away. We were there for the food though today, so we began with two delightful appetisers, Mixed Veg Pakora and Eggplant Crisps. Finger food has always been a mainstay of Indian cuisine, and these two appetisers, while not traditional Indian dishes, do not disappoint. 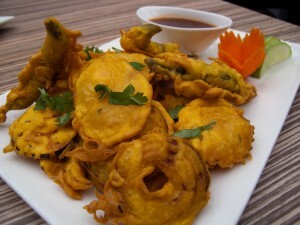 The Mixed Veg Pakora combines deep fried vegetables with mint garlic aioli as a dipping sauce, while the Eggplant Crisps comes with Glassy’s version of salsa – fresh tomatoes, onions and cheese. 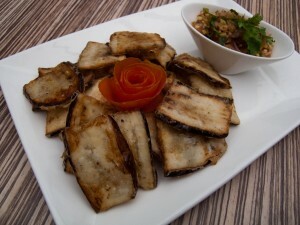 Eggplant never tasted so good! Next up, meats for eats. Glassy Bar & Grill serves many types of meats – chicken, lamb and fish – in a variety of ways. The portions are thoughtfully sized, bite sized tasty and succulent morsels guaranteed to satisfy the meat lover in you! 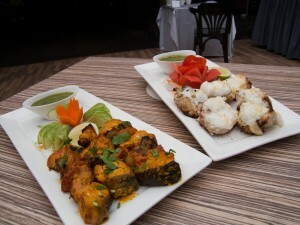 We had our fill of Salmon Fenugreek and Reshmi Kebab, both served with delicious mint sauce. The marinated salmon is flavoured with fenugreek leaves, charcoal cooked and served with indian bread while the Reshmi Kebab was simply lovely, the selected exotic spices blending to produce a balanced unique flavour for the well marinated chicken. 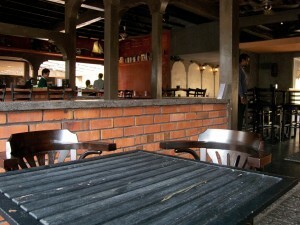 Mains at Glassy Bar & Grill are well prepared servings of meats and vegetables served with a selection of Indian breads. The varieties of breads served are definitely an eye opener, even for your typical Malaysian and include Lacha Paratha, Tandoori Roti, and Garlic Naan amongst others. We were lucky enough to sample 5 of Glassy Bar & Grill’s famous mains – Butter Chicken, Lamb Rogan Josh, Fish Moilee, Cumin Potatoes, and Palak Paneer, or Spinach Cottage Cheese. 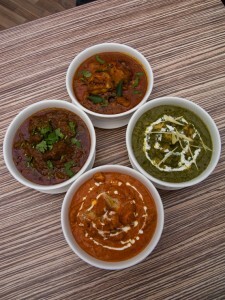 The mains - Palak Paneer or Spinach Cottage Cheese, Fish Moilee, Cumin Potatoes, Lamb Rogan Josh, and Butter Chicken. Served with an assortment of Indian breads. The Butter Chicken definitely is a culinary understatement. Pulled chicken cooked in a clay oven in rich tomato curry, it quickly became our favourite of the day. The subtle flavours merged well with the lightness of the chicken and did not overwhelm it, making the entire dish a sheer delight! The Fish Moilee puts most fish curries to shame with its superb balance of heat and rich spices. Light yet spicy, the pieces of dory fish meat sautéed with curry leaves, tomato, cilantro and coconut thrills but does not burn. It certainly leaves you wanting more, that’s for sure. For red meat lovers, the Lamb Rogan Josh is a definite must-try. The lamb chops cooked in onions, cilantro and mint sauce, is tender and tasty, guaranteed to melt in your mouth. Unlike some Indian lamb and mutton dishes, the Lamb Rogan Josh is not overbearingly pungent, rather has a hearty aroma that is bound to whet your appetite. Cumin Potatoes – potato pieces cooked with spices, cumin and tomatoes – may seem like a side dish, but rest assured, it holds its own as a main. Vegetables have always been central in Indian cuisine, and this simple cumin potato dish not only is a stomach filler, but an amazing adventure for the tastebuds! Last but not least, we come to the Palak Paneer, or Spinach Cottage Cheese. Homecooked cream spinach cooked with chunks of cottage cheese make this dish a truly unique dish, not only from a sense of taste, but also texture. It has a mild pleasant taste, and the chunks of cottage cheese goes so well wrapped between pieces of Indian bread. These are just some of the great dishes that await diners who venture into the Glassy Bar & Grill. It’s a great place to dine, and to hang out after a hard day’s work. If you don’t believe me, check out what Emily Tang had to say about it! 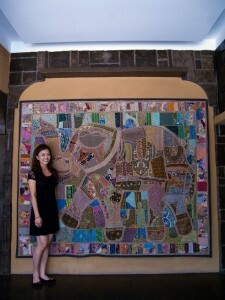 And yes, check out the lovely photos by Vincent Chong from foodmsia.com! Moola Frenz who dine at Glassy Bar & Grill are entitled to a 15% cash back everytime! What’s more, you can also grab FreeMakan vouchers for even MORE savings here!